In this post we will see how to configure QoS for wired & wireless ports based on its role.I have taken two example of VoIP phone connected switchprot (wired port) & AP connected switchport (wireless port). 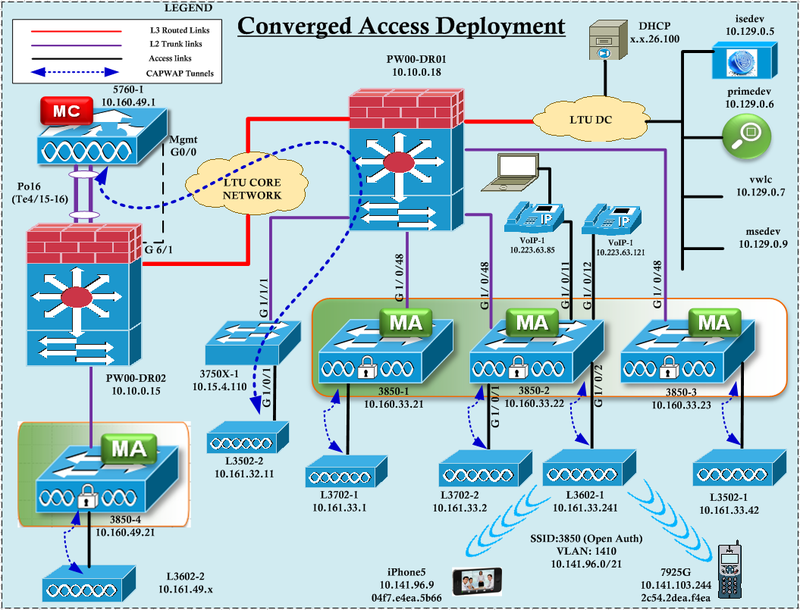 Here is our CA topology & I will focus on 3850-2 switch for this QoS configuration. IOS-XE 3.3.1 is used for this post & behavior may be different if you are using an earlier version of software code. Now let’s see make a call between these two phones & see how QoS parameters change. I have configured below SAPN session & my monitoring PC (BackTrack) connected to G1/0/47 of this switch. 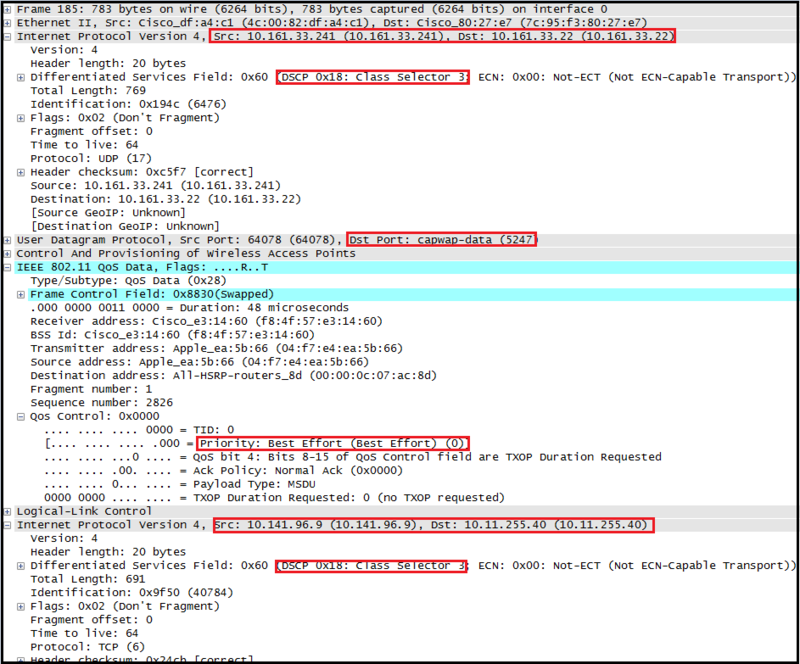 Here is the packet captures of signaling & RTP media packets coming from VoIP-1 phone connected to G1/0/11. Similarly Packets coming from VoIP-2 should have these classification when it comes to G1/0/12. Now If we are look at packet going to VoIP-1 (only RTP traffic since signalling go back to CUCM). As you can see traffic going to VoIP-1 has EF (or Priority 5 in dot1q header) which is same as incoming values from VoIP-2. This is very important thing to remember in this 3850 platform, which is by default QoS values (DSCP or CoS) received by a wired switchport will be trusted & pass-through to another wired switchport without a change. Now let’s see how this work when make a call between wireless phone to wired phone. To do this we will create a open authentication wlan called “3850” & map it to vlan 1410 under the AP group where L3602-1 configured for. (I used no broadcast-ssid since I am doing this in office environment & do not want to visible to normal users). Also I will uesd iPhone5 to illustrate QoS mapping changes as well. You can verify wireless client connectivity details as below. iPhone5 detail highlighted in purple color. 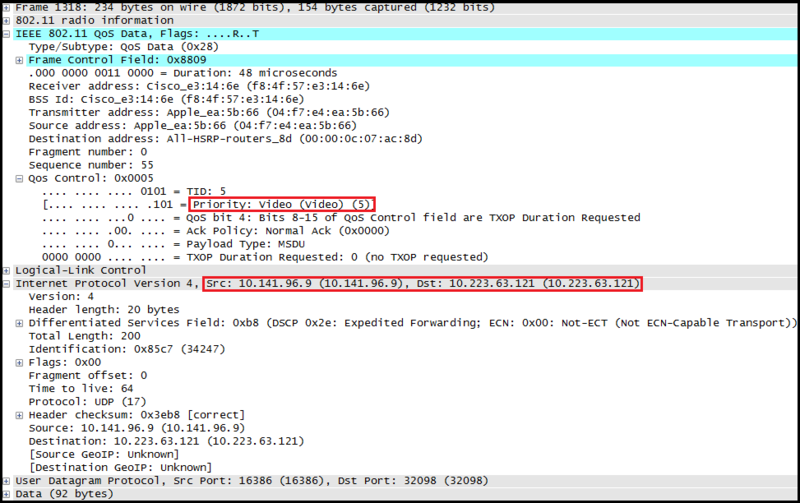 Now let’s take a look at the packet capture at G1/0/2 wireless port while we are making a call between iPhone5 to VoIP-2. Also note that I have removed default “untrust” behavior of this switch platform when traffic traverses wireless to wired or vice versa. If you do not do this outer CAPWAP DSCP will be re-written to BE (0x00) at this point. 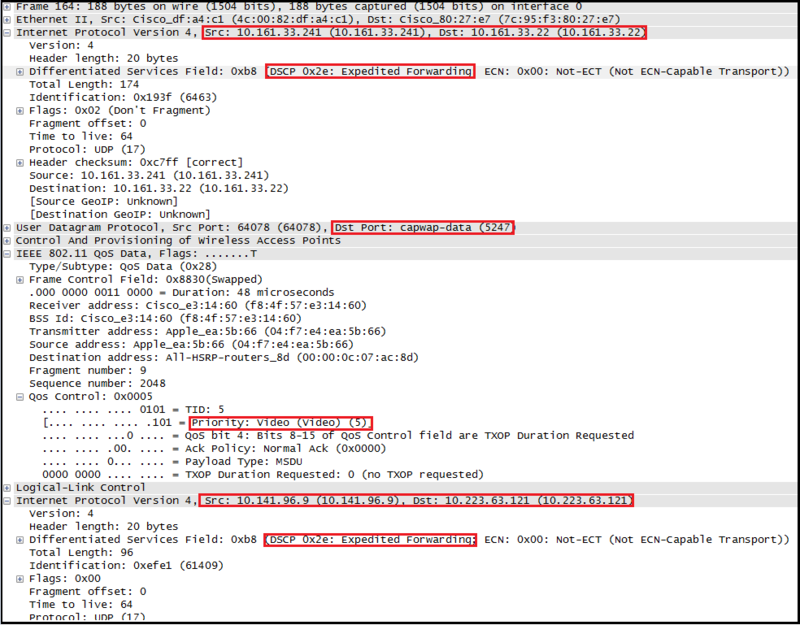 Below capture shows VoIP phone getting the packet with DSCP AF41 (instead of EF) & 802.1q CoS value of 4. Here is the signaling packet going out of trunk port (G1/0/48), since UP value came with 0, WCM rewritten the 802.1p to 0, then switch port rewrite original packet DSCP to 0 based on that. So it is important to classify your traffic Based on a corporate QoS policy, rather trusting DSCP (or WMM-UP value for wireless frames), since there is no consistency of these different clients. In a future post we will see how to classify traffic in order to get same treatment for wired & wireless traffic across the network. Hi, Great article. I tried to disable the default behavior of the switch, see below. But its not accepting the command.